Salvatore Ferragamo (1898-1960) was an artisan and an innovator during his fifty-year career in footwear design. His family name evokes beauty, traditional craftsmanship, and an assurance of quality and comfort. Born in Bonito, Italy, a remote hill town not far from Naples, Ferragamo was the eleventh in an agricultural family of fourteen children. Since poverty limited the resources needed to sustain a family, many Italians made their own shoes. Young Salvatore was determined to be a shoemaker and served an apprenticeship in a shop where each step was accomplished by hand. Intent on refining his knowledge and craftsmanship, he moved to Naples-at that time a hub for dressmakers, milliners, and shoemakers-in 1909, with the goal of learning accurate methods of measuring, fitting, and aesthetics. While still an adolescent, the imaginative and entrepreneurial Ferragamo returned to Bonito and set up a workshop with six assistants; under his leadership they produced custom-fitted, distinctively designed shoes. An older brother encouraged Salvatore to join him in Boston, where the Queen Quality Shoe Company hired him in 1914. Although modern technology mass-produced basic footwear, it was, in Ferragamo's opinion, heavy and clumsy. Subsequently he relocated to Santa Barbara, California, where he established a shoe-repair shop with the intent to create custom shoes by hand. Commissions included custom-designed boots and sandals for celebrities and silent film stars from 1914 to 1927. In 1923 Ferragamo opened the legendary Hollywood Boot Shop in Los Angeles. Celebrities often commissioned outrageous footwear, such as pumps with appliqué patterns or sandals decorated with pearls or feathers. During the 1920s Ferragamo labels could be found in stores like Gimbel's and Saks Fifth Avenue. Ferragamo's standards for measuring and sizing, combined with his originality, influenced the entire industry. Although handmade shoes became an exclusive product for discerning clientele, he collaborated with American manufacturers to design mass-produced shoes as well. Following fifteen successful and creative years in southern California, Ferragamo returned to Florence, Italy, in 1927 to organize assembly-line production of hand-crafted shoes. He took advantage of the inherent qualities of Italian craftsmen and the availability of superior materials to create legendary footwear. In 1940 he returned to his hometown to marry Wanda Miletti, the daughter of the village doctor. Their life together produced a family of six children, all of whom became involved in the family business. The American stock market crash of 1929 devastated the Italian economy, resulting in Ferragamo's bankruptcy. An undaunted entrepreneur, he managed to reestablish himself in Florence, and by 1937 he was able to purchase the elegant thirteenth-century Palazzo Spini-Feroni, one of the most historic buildings of the city, which became his workplace and showroom. By 1939 four hundred employees produced two hundred pairs of handmade shoes per day. Florence was once again a popular tourist destination by 1950, and international clientele frequented the elegant Ferragamo shop on via Tornabuoni. Although Ferragamo's eldest daughter, Fiamma, had studied classics at the university, she observed all stages of her father's business from an early age. Following his death in 1960, she assumed responsibility for 700 workers who produced 350 pairs of shoes a day. The labor-intensive practice of making shoes by hand vanished by the end of the 1960s. Her sister Giovanna had studied fashion design in Florence, preparing for the eventuality of apparel as a new direction for the family business. Motifs from classic Italian art inspired her patterns and colors for an early signature collection of ready-to-wear for women in 1959. In the 1970s the company expanded into producing small leather goods, luggage, scarves, and perfume for the international market, in addition to footwear. In the early twenty-first century the heirs continued to conduct business from the Palazzo Spini-Feroni. Wanda presided as chairman, and her son Ferruccio was the chief executive officer. Fiamma died prematurely in 1998 after almost forty years as the vice president responsible for product design. Her visionary initiatives built the company from a custom-made shoe business for the privileged few to a global, privately owned corporation. Today the company produces high-quality ready-to-wear and fashion accessories in addition to men's and women's footwear, all of which is available in exclusive and flagship stores around the world through joint ventures and licensing agreements. In addition the company subsidizes cultural restorations and sponsors international competitions for young shoe designers. Wanda Ferragamo recalled that her husband was motivated by faith in his abilities. He was strong-willed and optimistic, determined to prosper. His workers remember that he transmitted confidence, and although he demanded discipline, he also recognized merit. He did not sketch his ideas, but as a great improviser and engineer, he intuitively cut samples and draped materials on wooden shoe forms to convey original ideas to his production staff. In 1948 an exhibit at the Palazzo Strozzi in Florence, displaying two hundred models of Ferragamo's footwear produced between 1927 and 1960, was installed. Each pair was presented as a work of art. The exhibition traveled internationally and became the foundation of the archives in the Museo Ferragamo at the corporate headquarters. In 1999 the company won the Guggenheim Enterprise and Culture Prize for its investments in the sphere of culture. 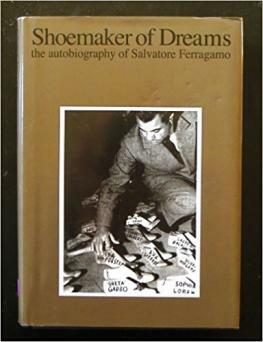 Ferragamo's autobiography, Shoemaker of Dreams, first published in England in 1957, details his career. As a true artist, Ferragamo found ways to create even under the most limited conditions. During World War II, restricted to using only the poorest of materials, he became known for his inventive use of what was at hand. Hemp cord and the strong, multicolored cellophane wraps of candy and cork were readily available in this region of wine making. He ingeniously placed the supportive metal shank precisely in the instep of the shoe, freeing the joints and heels from supporting body weight. Weightless qualities of both design and construction became Ferragamo's hallmark. He sculpted cork into wedge platforms and heels and dyed raffia to be woven for upper constructions. In 1947 he appropriated the clear filament wire used by fishermen to create straps around the foot and ankle to create the illusion of a seductive, feminine "Invisible Shoe." In 1938 Ferragamo tapped into the allure of the prevailing theme of Orientalism. He created an upturned toe that he called the Oriental mule. He patented shoes with heels fabricated in steel. He coined the term shell soling for upturned soles. Narrow toes and slim high heels counterbalanced the voluminous gowns of designer Christian Dior, creator of the New Look of 1947. 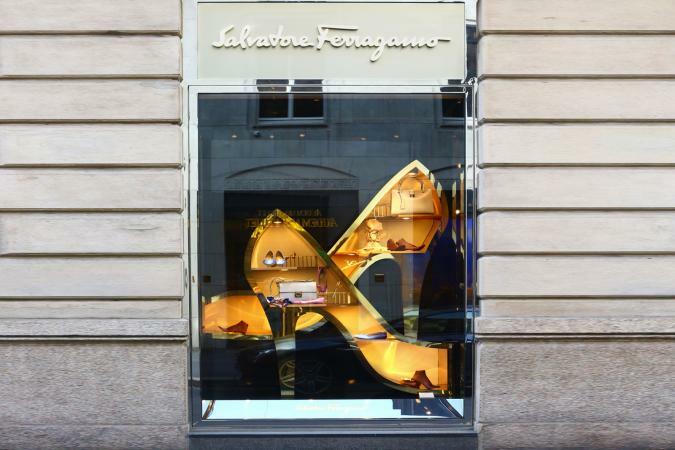 Ferragamo introduced a sculptural high heel carved into an F, his signature letter. In 1961 Fiamma collaborated with the up-and-coming Florentine noble, Emilio Pucci, on a display that accessorized colorful and vivacious garments with footwear. Fiamma Ferragamo is the creator of the most popular shoe style ever produced by the company: the Vara, a practical, midheel pump adorned with a signature metal buckle and stamped with the family signature and grosgrain bow, remains a wardrobe staple today. Ferragamo stressed that his success was based in technical expertise and a discerning sense for materials, combined with a knowledge of anatomy and his admiration for the allure of the female leg and foot. In the early 2000s the company continued to produce high-quality products made of superior materials with the same sophisticated standards originally established, sustaining the legacy of a truly unique man. See also Orientalism; Shoemaking; Shoes. Angioni, Martin. Fashion and Art Newspaper, no. 76, December 1997, p. 21. Salvatore Ferragamo, Stefania Ricci, and, Edward Maeder. Salvatore Ferragamo: The Art of the Shoe, 1898-1960. New York: Rizzoli, 1992. An exhibition catalog. --. Shoemaker of Dreams: The Autobiography of Salvatore Ferragamo. New York: Crown Publishers, 1972. Stengel, Richard. "The Shoes of the Master." Time 139, no. 18 (4 May 1992): 72.